Jeremy Warsh has been in off-mode ever since his grandpa’s death a couple of years ago. He set aside their shared passion, comic art, and hasn’t looked back. As an introvert from the other side of town, he fully expects to spend his boring life bagging groceries until, maybe one day, he’s promoted to store manager. I was a bit on a contemporary spree last week, so I couldn’t pass up the change to read The Evolution of Jeremy Warsh when I came across it. Contemporary and LGBTQIA+? I could not resist – and I don’t think any of you would expect me to either. The synopsis itself intrigued me as well – especially the prank-part. I was curious to see how that would play out and hoped to the skies the LGBTQIA+-part of the novel would not have anything to do with it. The speed I read this with! Honestly! I didn’t quite expect to fly through this novel so quickly as I did? During the first chapter, I noticed how descriptive and detailed Jess Moore’s writing is, so I guess that explains my expectations on that front. I’m so happy that this writing style didn’t have any influence as to how immersed I was in the story. Because I was absolutely, totally lost in the best way possible. Everything happens at a pretty slow pace. The first part of the story focuses way more on explaining Jeremy’s life and the stories of side characters than it does on the actual plot we’re waiting for – aka the love interest and the prank. It didn’t feel like it was dragging on at all though – on the contrary, I loved it! The focus on Jeremy’s life, relationships and personal evolution is what makes this story so special. In saying that, I really have to mention that there’s parental homophobia present in this story regarding one of the side characters. This novel is set in 1998-1999 – which isn’t an excuse, but it felt like a true representation of how a lot of parents would have handled it back then, unfortunately. It was harsh to read about for sure, but it was also challenged. Everybody’s gonna critique you, son. And it will feel like they are picking apart pieces of your own skin. But listen to me now, all those critiques point back to the person who said them. It’s their perception, that’s all. As for Jeremy himself; he easily stole my heart. He lives with his mom, barely hears or sees his father and loves drawing. On top of that, he’s plus-sized and.. in a very subtle way doesn’t actually mind it, even though he does try changing himself over the course of the story. It wasn’t very focused upon, which made this aspect all the more precious to me. That’s not even mentioning how he’s trying to find himself, second-guessing his sexual identity and that definitely is a huge plus in this novel. Especially since it’s shown a label isn’t really necessary as long as you’re happy yourself. Bonus points! The romance! Like I said, it isn’t mentioned or really focused on until later in the novel. I loved it. Honestly. Loved. It. It isn’t necessarily slow burn since.. well.. hormones are evidently in play a bit, but simply the fact that it isn’t a huge aspect of the story made me love it all the more. I even wish we had seen a bit more of it to be honest! Last, but not least, I want to talk a tiny bit about the ending because I truly loved it. It didn’t feel like the typical ending to a lot of contemporaries. On top of so many other aspects making The Evolution of Jeremy Warsh so unique, this was definitely the cherry on top. I’m even wishing and hoping for a sequel? I don’t even know if that’s a possibility but I’m still hoping for it anyway. Maybe Kasey’s story. Or Stuart’s. Or more of Jeremy?! She’s not afraid to be with somebody, not scared to be who she is, and I’m jealous of that. I’m tired of seeing this plain-faced kid in the mirror and wondering why he’s allowed to take up so much space. I want to recognize what makes me, me. This has nothing to do with the actual story, but with the cover: I wish they had used an actual plus-sized boy on there! 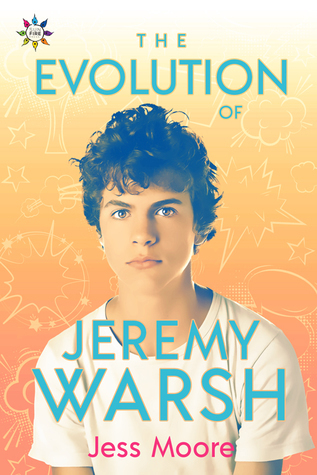 It doesn’t even matter what kind of evolution Jeremy goes through – he’s plus-sized when the story starts so they should depict him as such. Or is that me being too focused on that aspect? I don’t care – just please, change the cover?! Please?! If you think you’re the only person afraid of not knowing who they are, you’re an idiot. At the very start of The Evolution of Jeremy Warsh, there’s this event where a male side character is talking to Kasey and.. adjusts himself. Twice. Like. It grossed me out and was totally, entirely unnecessary at that point. The fact that I didn’t even highlight it while reading and still remember it, says plenty. Ew. Kasey, one of Jeremy’s best friends, got a bit on my nerves at times. Overall there’s nothing wrong with her – at all. I pitied her a bit because of the way she came out but.. she has these manipulative tendencies towards people. I can’t cope with behavior like that, especially if said person isn’t even called out for it. Which she’s not. Repeatedly. And I couldn’t even see why it was necessary to the story either so yeah. Even though I have some “issues” with it, those are so minor that I just.. I love this book, okay? I can’t not give an awesome rating?! Do you prefer the romance in contemporary to be more in the center? Or do you prefer it disappearing in the background once in a while? What’s the last contemporary you read and absolutely loved?